*This section explains the process of emailing invoices to the email ID’s configured on the funding sources using the template configured on the email template form. The following fields have been added to the Post invoice proposal form, which populates information based on the setup done on the Project + parameters form, as described in the Parameter setup section. 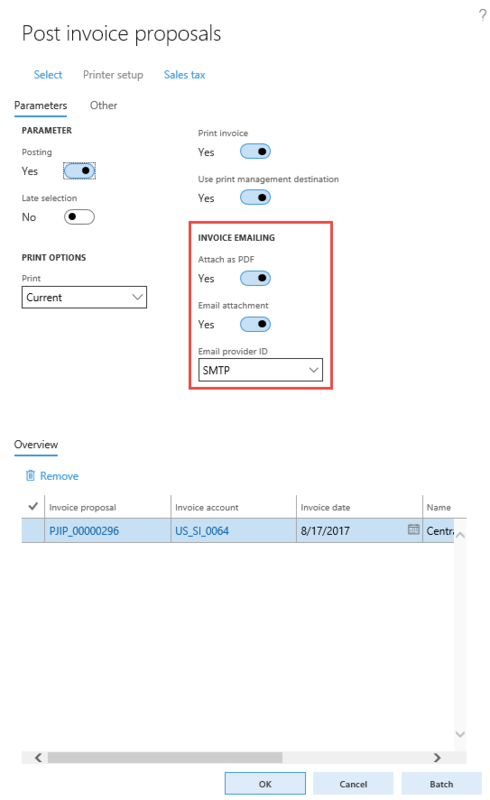 You can modify the fields on invoice proposal form and process the invoice proposal. The Email attachment check box is selected. The Print invoice check box is selected. The email displays the details of the invoice in text and contains the PDF file of the invoice as an attachment. You can click Add to add more attachments, if required. The attachment to the mail has the name of the customer, legal entity, and the invoice number as a naming convention. The following changes have been made in the listed forms, to allow the user to make optimum use of the invoice emailing feature. Go to Projects management and accounting > Project Invoices > Project Invoices. Invoice sent electronically: If the invoice is sent in the email, the invoice sent electronically field displays Yes. Email sent date: The project invoice record displays the date on which the email for the invoice is sent. If the user has resent an email, then the Email sent date reflects the date the email is resent. Open attachment button: Allows the user to open and view the attachment for the record, if any, for the selected invoice record. 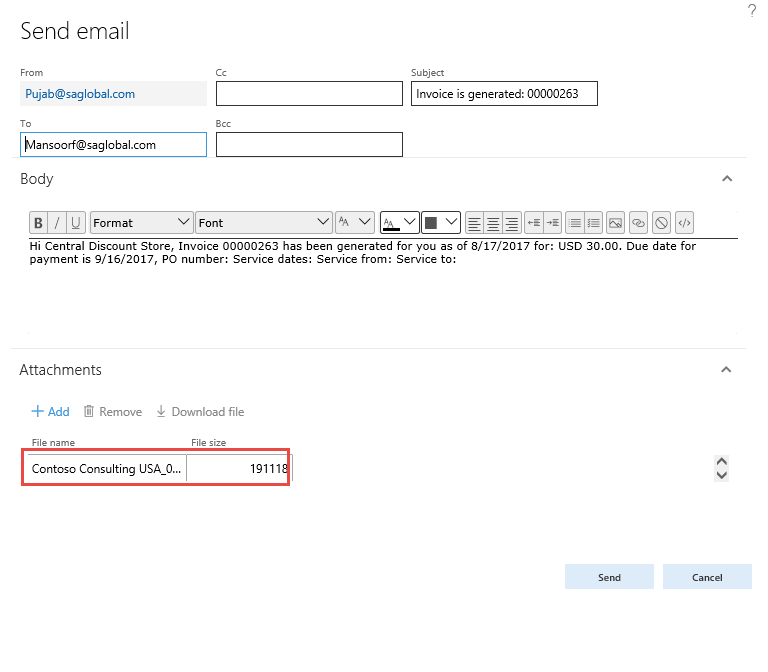 Download attachment button: Allows the user to download the attachments, if there are any for the selected invoice record. Re-send email button: Allows the user to resend the email for the selected invoice. It also allows the user to select more than one invoice as an attachment.